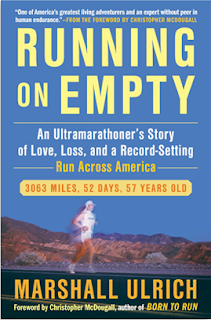 If you have not yet picked up Running on Empty by Marshall Ulrich you need to head out and pick it up. The story of how Marshall had his toenails surgically removed as well as the many other stories will not tell themselves. 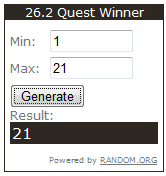 Without further ado, lets see who the lucky (and very impatient I assume) winner is. We had a total of 21 entries. Some of the comments were from those who did not want to be entered, and one from me so I pulled them out before the count. The Random number generator was not very interesting this time and gave an output of the same number that I put in. The number 21 is the lucky number and John Heywood from Flying Horse Design is that lucky winner. Please contact me at info@262quest.com with your mailing address so the book can be mailed out to you. Work is starting to get back to normal so I am hoping the blog, Facebook, and Twitter communities will get back to normal. Thanks for hanging on and hanging out! Don't forget to share 26.2 Quest with all your friends and running partners. well done John. To make it easier for my brother-in-law I have decided not to try to win items from him. Congrats!! Wow, only 21 people wanted to read this. I think it looks really interesting! Received the book today thanks Tim!